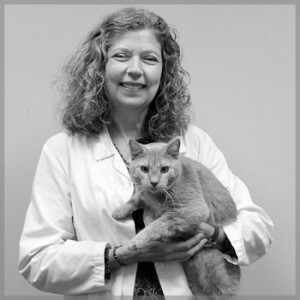 Dr. Mary Sullivan’s veterinary experience spans over 30 years and several states. Throughout her diverse career she has focused on supporting the human-animal bond by providing compassionate and practical veterinary care. In addition to practicing general medicine, Mary has a special interest in animal ophthalmology. One of Mary’s greatest pleasures is participating in the joy people experience when their beloved animal is once again feeling well. Her confidence, insights and warmth are a comfort to clients and patients alike. Mary focuses on her family and friends when she is away from the hospital. Her husband is a civil engineer, and they have three children who are rapidly becoming young adults. Currently they have 2 cats, but are missing the assortment of dogs, fish, hamsters, lizards and sugar gliders that have graced their home in the past. Mary enjoys singing, kayaking, downhill skiing, and volunteering for church and community events.